Detroit is seeing a development and construction boom that it hasn’t seen in decades. This map discusses 12 of the most anticipated renovations happening in the city. From buildings that were vacant for decades (the Metropolitan Building, the James Scott Mansion), to some that are currently vacant and hold a prominent location (like the Old Wayne County Building), in the coming years we’ll see these buildings filled with residential, hotels, office space, and more. We didn’t include the biggest renovation in the city—the massive Packard Plant redevelopment—which is included on our transformative development projects in the city. The Packard Plant renovation and redevelopment could take up to ten years. What compares on this list? The Herman Kiefer Complex redevelopment in Virginia Park. 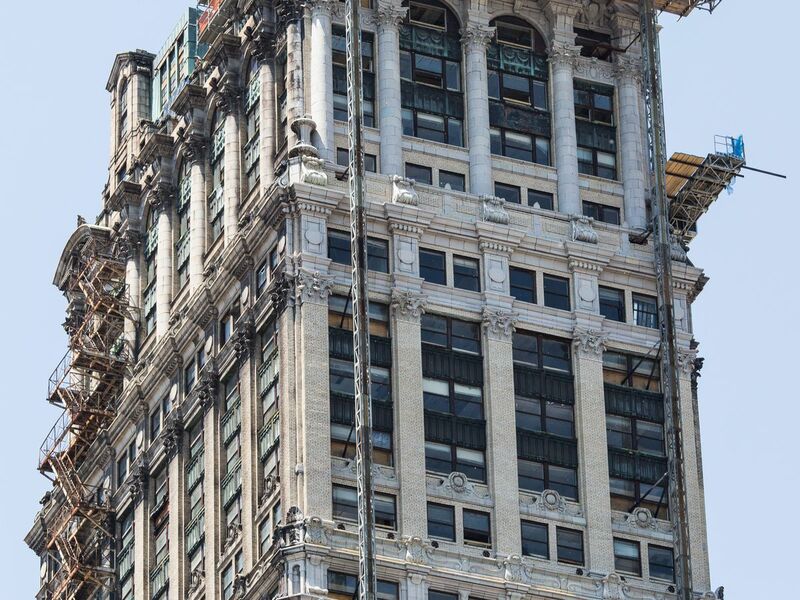 The Wurlitzer Building will open as The Siren Hotel in late 2017. The building was falling apart a few years ago, and a sign still remains next to it offering coffee to anyone who buys the building. ASH NYC is leading the rehab, and the boutique hotel will have 106 guest rooms, two retail spaces, a rooftop deck, and seven food & beverage spaces. Vacant for 40 years, the renovation of the James Scott Mansion in Cass Corridor has been underway since March 2016. Led by developer Joel Landy, the mansion will be turned into apartments. Mlive reports that they should be ready this winter. Bedrock acquired the Capitol Park Art Deco skyscraper in 2015, after a Chinese investment group neglected the building. Work has been underway for a while to restore it back to its original beauty. We can expect it to re-open in 2018, with retail, residential, office space, and hopefully the SkyBar. Our photographers stopped bypre-disaster in 2013, if you’d like to see what it was like inside. Bedrock and Shinola are redeveloping basically half a block of lower Woodward into the Shinola Hotel, which will have eight floors with 130 rooms and 16,000 square feet of retail and restaurant space. Two smaller buildings have been demoed in order to rebuild and connect the structures. New construction has started on the parking lot behind it, plus an activated alley will connect it all. It’s located right across from the Hudson’s site. Expect the hotel to be completed in 2018. This Islandview redevelopment will convert an old school into 25 condos, with additional penthouses. More construction is planned nearby. Banyan Investments is leading this development, along with the Stone Soap redevelopment along the East Riverfront. We should see more redevelopment in both areas in the coming years. Looming over the new Little Caesars Arena is the Hotel Eddystone. In an announcement this spring, Olympia said they would renovate four buildings in the “District Detroit,” including the historic Hotel Eddystone. Expect 96 residential units and ground-level retail. Exterior work has started. Also a part of the Olympia renovations, the United Artists Theater at 150 Bagley will be redeveloped into 148 residential units plus first floor retail. Renovations could start later this year on the 18-story building. No word yet on what will happen to the theater itself. Bedrock purchased the old Detroit Free Press Buildinglast fall, which had been vacant since 2001. Construction on the $69 million redevelopment is expected to start this fall. We can expect ground floor retail, two floors of office space, and residential through the rest. A group of New York investors purchased the Old Wayne County Building, which the county sold in July 2014. Exterior work has been happening this year, and the owners have been looking for a single tenant to fill the Beaux Arts structure downtown. This isn’t an all out restoration like many of the others, but it would be nice to see this building back to its original building and in use again. If you’ve been near the Book Tower in the past six months, you might have noticed that it’s been power washed for the first time in decades. The difference is striking. Bedrock bought the building in 2015, and the renovation—which will include residences, offices, retail, and a possible high-end hotel—could take until 2019. It’ll be a big day in Detroit when we see the Book Tower lit up again. This redevelopment could take a lot of time and a lot of money. Led by New York developer and architect Ron Castellano, the redevelopment covers 18 acres of the former hospital complex and could cost $100 million. Early plans could include a hotel and a skate park, and altogether, it could take up to 8 years to complete. The developer has also purchased many blighted homes in the neighborhood.